About Ultra Long-Range UHF RFID Sensors - Phase IV Engineering Inc.
To see the playlist of 7 videos click on the playlist button – top left of viewer. Ultra-long read range - up to 25+ feet. 20+ feet with battery-assisted sensor. Up to 15 feet with battery-free “credit card sized” tag. This long range opens the door to use wireless sensors in many new, innovative applications. Smaller than a credit card. Ultra-miniature options available. 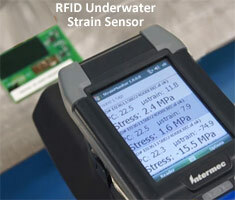 We offer many types of sensors: humidity, pressure, strain, etc. Multiple & tethered sensors available. No batteries make these sensors virtually maintenance-free. Our specially designed and optimized antennas make it possible for RFID sensors to transmit through metal. 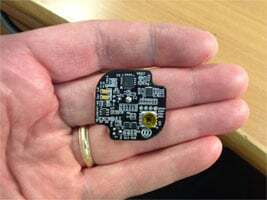 How do you want to use long-range RFID sensors? We’ll help you find the best solution. Use a hand-held or simple desktop reader. Sensors interface with many standard UHF EPC Gen2 readers. Data can be stored and graphed using MS Access®, Excel®, or other database. Read the RFID Journal feature article that describes how Phase IV’s worked with the NASA Marshall Space Flight Center to solve a major problem with the Urine Processing Unit (UPA) that converts urine back to drinkable water at the Space Station. Read the article in the RFID Journal, “MOST INNOVATIVE USE OF RFID, NASA Marshall Space Flight Center, Solving NASA’s Water Problem”. 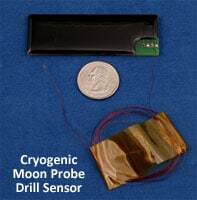 Custom Engineered Sensor Systems – Adapting our sensor technology to your needs is our specialty. Custom Designed UHF RFID Antennas – RFID sensors are electrically very different from standard RFID (ID-only) tags. To get the optimal performance, custom-designed and optimized antennas are required. 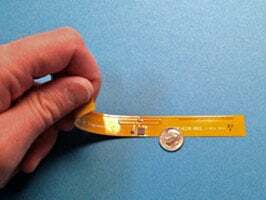 Leverage our staff of experts and our 20+ years of experience with RFID sensor antenna design to get an RFID tag with the best possible performance. Several UHF RFID Sensor Technologies supported – which allows us to find the best chip and electronics design match for your special sensing need. 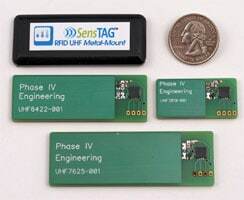 We are the “go to” System Integrator of all RFID sensor chips – Every RFID sensor chip supplier will recommend Phase IV for your tag design and full system integration. Phase IV offers full turn-key design – with our complete staff of electrical, mechanical, firmware, and software engineering staff. Battery-free = Maintenance-free. Remote sensor ideal for where changing batteries isn’t an option. 10X the Read Range of previous passive (battery-free) RFID sensors with upt to 15+ feet using a stationary reader and up to 5 feet with a hand-held reader. 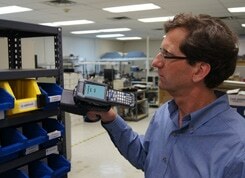 Read with Many Standard UHF EPC Gen2 Readers such at ThingMagic and Intermec. Available in Standard Credit Card Size. Measure temperature and more – we offer many types of sensors: pressure, strain, voltage… Custom multi-sensor SensTAGs also available. Amazing 20+ Foot Read Range using standard EPC Gen2 readers. Nearly 10-foot read range with hand-held readers. 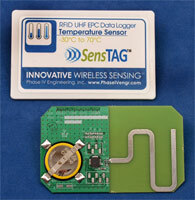 Our new sensor technology has revolutionized RFID sensing! Batteries that Can Last Over 10 Years make these wireless sensors practically battery-free.TM. Available in Standard Sizes that are optoimzed for different types of equipment monitoring. Measure Temperature with a Range of -40ºC to 125ºC. Accuracy better than +/-1.0ºC. Mounted directly to metal, these special SensTAGs can transmit sensor readings to a standard UHF EPC RFID reader. 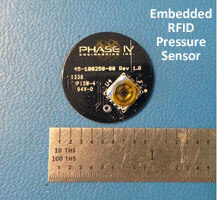 A breakthrough in RFID sensing. Ideal for equipment monitoring. 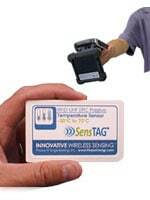 Our wireless sensors are small, quick to install, and enable rapid data transfer to a reader that archives the data. Available in several sizes for different metal-mounted monitoring applications. Battery-free = Maintenance-free. Ideal for deploying wireless sensors where changing batteries isn’t an option. Custom configuration and packaging available for unique or rugged applications. Multi-sensor. Humidity and temperature, pressure, strain, and more.